According to more progressive pedagogic wisdom, children are supposed to learn and understand better if the teaching process is made more hands on. Over the years i have been trying to do precisely so with history. But one is not too certain if making history more experiential in itself brings about learning in terms of reasoning, identification, analysis and application. I suppose such learning is predicated on certain measure of language skills, observation skills and listening skills. In the absence of latter I would imagine, activities which attempts to bring in higher order thinking skills, comes to naught. But perhaps it is also possible to look at this matter the other way viz. skills, either the 'higher order or lower order' all develops simultaneously and the issue is whether we challenge the cognitive domain of a child in such a fashion that all the skills are spurred into operation. It can be argued that skills, even the alleged lower order skills are intertwined with 'higher order' skills and therfore even observation, listening skills comes into effect only when at many levels reasoning and analysis are also in operation. Background - Be that as it may, while dealing with ancient Indian history - from the period of janapadas to Guptas one of the problems one comes across is the very limited visual element . Unlike ancient Egypt, Greece or Rome we do not see grand buildings, monuments or even icons (till Kushana period) to help anyone, leave alone a child, to get a feel of these periods. The materiality and the visual expression of this epoch in India's history is something that only a few can fathom. Western historiography on the other hand by a careful study of say Greco-Roman cultures' art and visual expression, been able to reconstruct that past in more detail. For example we have books for children where their attires, food, houses etc are well represented and documented which helps children to get a better feel of the same. ii. it has also not been contextualized in such a fashion that full import of the material, the socio-economic and political condition of the times, sinks in. Our books fails to bring about any such connections and historicize matters. ii. help kids to arrive at certain observation, reasoning i.e. understanding of ancient India. 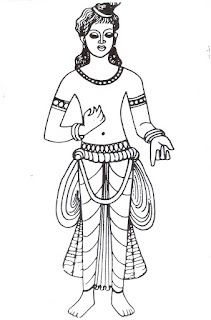 The materiality I was looking at was the attires and fashion which existed among different social groups in ancient India specifically from Satvahana to Gupta period. 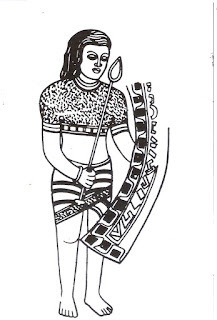 For this an NBT book titled 'Ancient Indian costume' by Roshen Alkazi helped me to figure out a way through which I could convert the sketches given in the book - which provides outlines of different costumes/attires based on mural paintings and sculptures found largely in Ajanta, Bagh caves, Nagarjunakonda, Sanchi and some museums as well - as a pedagogic tool. 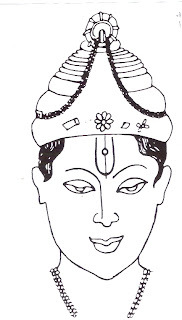 The outlines in this book (see pictures) of different people who appear in the Ajanta paintings, (the kings, courtesans, warriors etc), and from sculptures of Nagarjunakonda, Barhut, Sanchi lends itself to more concrete identification of costumes than directly through the murals and sculptures itself. 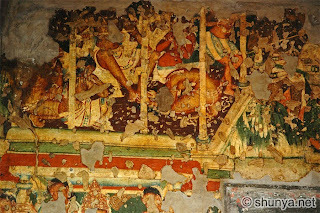 Much of these murals and sculptures today stand smudged and worn and as one may be aware they largely depict scenes from Buddhism i.e. Buddhas own life, Jataka tales etc. 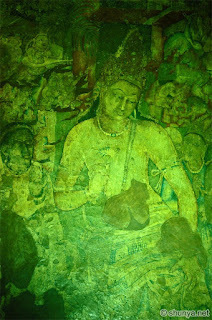 These murals and sculptures over a period of 500 years (approx), from the period of Satvahanas to the reign of the Vakatakas, a contemporary of the Guptas, thus becomes an important source for the study and understanding of not just the Gupta period but even those societies preceding it. 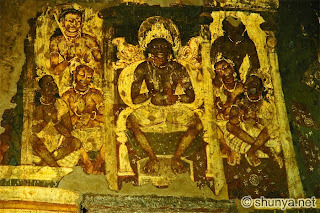 Indeed these paintings at Ajanta, along with the numerous chaityas and viharas here and the caves and paintings at Bagh and the Vishnu temples at Deogarh - for the first time such concrete visualization from an ancient Indian period are seen in such numbers. Based on these one can make certain informed guesses as to the how actually the people during and before the Gupta period could have possibly lived. ii. to identify changes in dress style as gleaned through these pictures over a period from say Satvahana to Guptas i.e. some 500 years. iii. 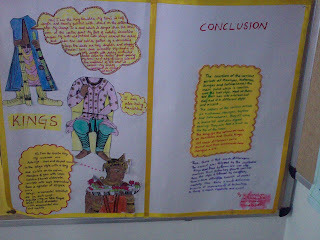 I also asked them by looking at the photo-prints, to colour the photocopied outline images. 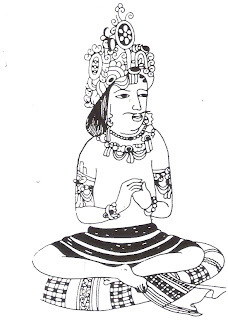 To the other group I gave multiple copies of the famous sketches of Padmapani Bhodisatva and the Apsara, in an outline format from the Ajanta murals. By looking at the photo-prints of the different Ajanta murals I wanted the students to fill up the remainder of the space of these two sketches by drawing images or floral patterns similar to the style which fills the walls of Ajanta. Conclusion- In a sense this experiment of mine paid off some limited dividends. 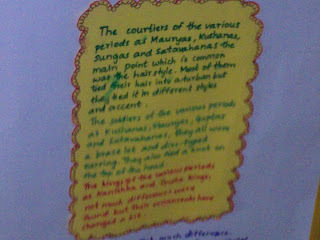 Children's attention was drawn to those aspects of ancient Indian history which are not highlighted in conventional books and secondly to help them to see how changes happen (or does not happen) in more concrete fashion (pun intended) rather than merely look at economic and social structures alone. Aspects like attires, food, buildings etc are those that children can easily observe and connect to and thus they are more attuned to notice the changes thereof. 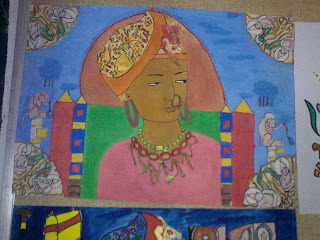 The kids also in their attempt to draw in a similar vein the murals in Ajanta, got a better feel of the art form and style. But then technically speaking as one would surmise by looking at their work, their actual drawing skills as in their ability to reproduce, was very limited.